Welcome to The Truth is…, the Miketendo64 feature series where our writers can go mad with their gamer confessions, wants and needs, and stepping up to the bat today is our very own Solid Jack! Whenever I think about The Legend of Zelda: Breath of the Wild, one of the first things I often thing about, is the events that took place in the past. 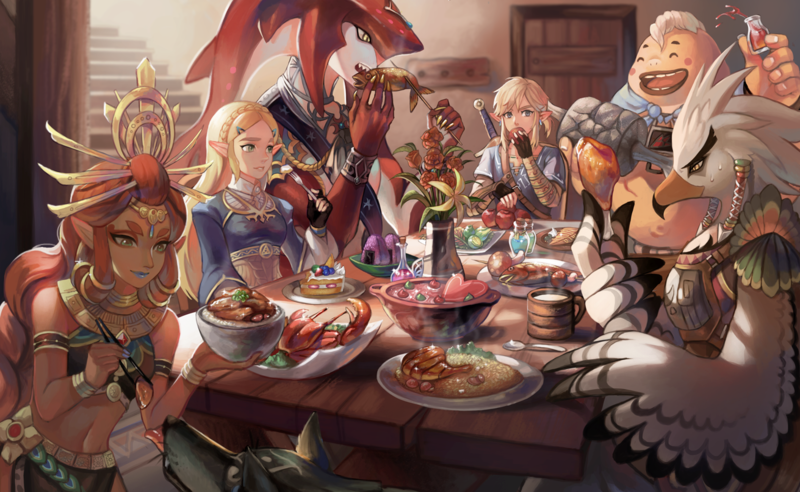 The Champions, Zelda’s struggle. Link’s defeat and the unanswered questions. Two years after its release and there is still a lot about the game and its world, that we don’t know and it’s because of that, I can’t help but want a prequel game. While some would rather a sequel, I personally would prefer a game set in the past. One that could open with a Hyrule at peace, vast and various towns to explore and NPCs that are so overjoyed, they will talk your ear off with their happiness, but then enter Calamity Ganon. Peace is soon replaced with war, the Yiga are out in full force and the King of Hyrule has no choice but to turn to Link and Zelda to assemble the Champions. With a setting such as this, the prequel would have the potential to be the darkest and most emotional Zelda game to date, especially when you consider the fact it could end with the death of each Champion and Link’s defeat, causing Zelda to take him to the Shrine of Resurrection. Furthermore, because of the emotional aspect the prequel could wield, it can make your next playthrough of Breath of the Wild have you feel things you didn’t feel before, similar to what Xenoblade Chronicles 2: Torna – The Golden Country did for Xenoblade Chronicles 2. What’s more, is although the game could take place in the 100 years prior to the present in Breath of the Wild, but it can expand on the events that took place 10,000 years ago and feature playable segments. But then, who should develop such an undertaking? Obviously Nintendo, but given the fact a prequel such as this would be the Zelda’s answer to Torna, why not get Monolith Soft involved? Having already assisted with Skyward Sword, A Link Between Worlds and Breath of the Wild, they have already proven themselves capable of working on a Zelda game, but even if they aren’t allowed to be the primary developers, as long as they’re involved with scripting the story and dialogue between the characters. It would help to make this prequel a true Zelda game to remember. Also, if given the chance to have a larger role with the development of the game, Monolith Soft could bring over gameplay elements used in Torna, such as an adapted version of Blade Arts, which can be available when Link is paired up with a Champion, but also a better implemented version of the community feature. I realize these kind of additions won’t be welcomed by everyone, but you need to remember that The Legend of Zelda: Breath of the Wild is a special game, the kind that you just replicate without adding any new changes. It’s the kind of game that helped evolve a series and the only way you can continue the Breath of the Wild story, be it as a sequel or a prequel, is to take what was done already and evolve it even further. Still, that’s just my personal feelings on this particular matter and if you’ve got any of your own to share, I’d love to hear them. In the meantime, this has been The Truth is… and I hope you enjoyed the first instalment.